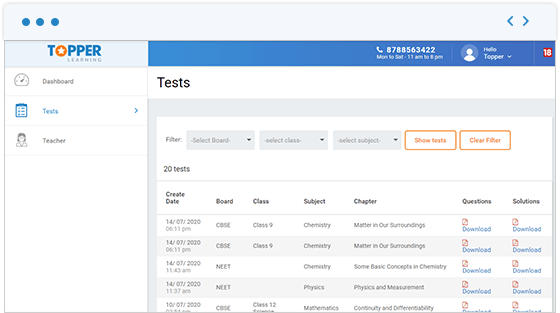 A customised interface for schools and coaching centres, wherein they can create their own tests - board-wise, class-wise, subject-wise, chapter-wise and even topic-wise - and can choose their own set of questions. Empowerment: Facilitates our teachers and educators to generate tests on a weekly or monthly basis. Quick access: Enables users to access our question banks. Segregation: Questions are segregated board-wise, class-wise, subject-wise, chapter-wise and topic-wise. Extensive set of questions: Our question bank contains over 1 lakh questions. Saves time & cost: Our test generation is an effective way to create tests, thus saving your time and resources. 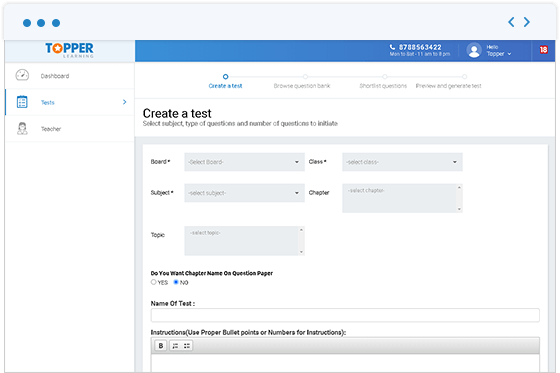 Easily customisable: A quick way of generating tests and the answers are also provided. Steps you need to follow in order to customise your test. 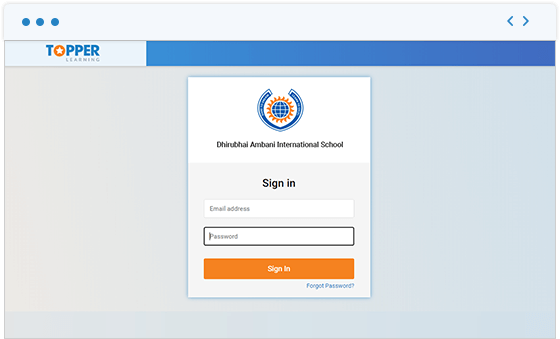 Your customised login page includes your logo, your name and provision for your students to log in with their credentials. 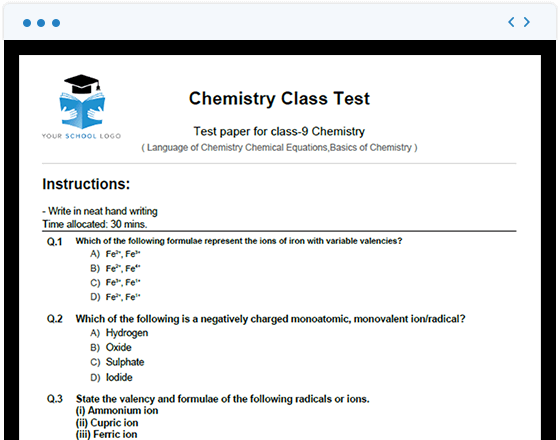 Choose a board, class, subject, type of questions and number of questions to set a test. Choose questions as per the filters selected. You have thousands of questions to choose from. 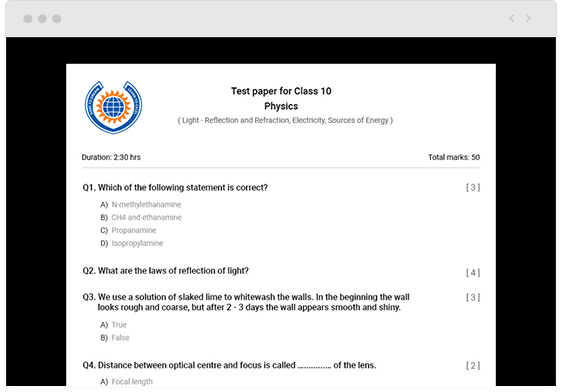 Once the number of questions are displayed, you can shortlist the questions you wish to add to the test. 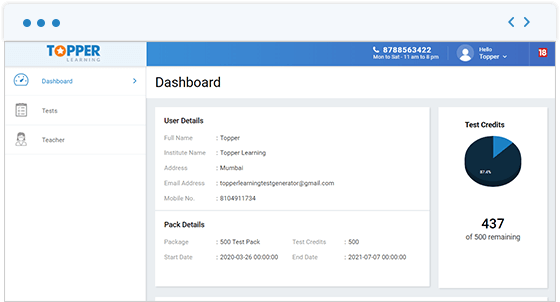 After you are done with shortlisting the questions, you can choose display order of questions, preview and generate the test for your end users. Hurray! This is how your test will look! Get an in-depth analysis on the number of tests you have created. Create your own test with your own logo and customise almost everything. After you create your test, choose a teacher to track the progress of a student. Found something interesting or have an idea? Talk to our academic advisor on how to develop your own test for your students.